After working on national social media platforms, Saint Mary’s sophomore Alec Rudh knows to keep his statements short and to-the-point. The sport management and business analytics double major from Hastings, Minn., may not have been at the scene of every jaw-dropping extreme jump or trick, he saw them all from the back end, as he was editing posts for four social media platforms, YouTube, Facebook, Instagram, and Twitter. 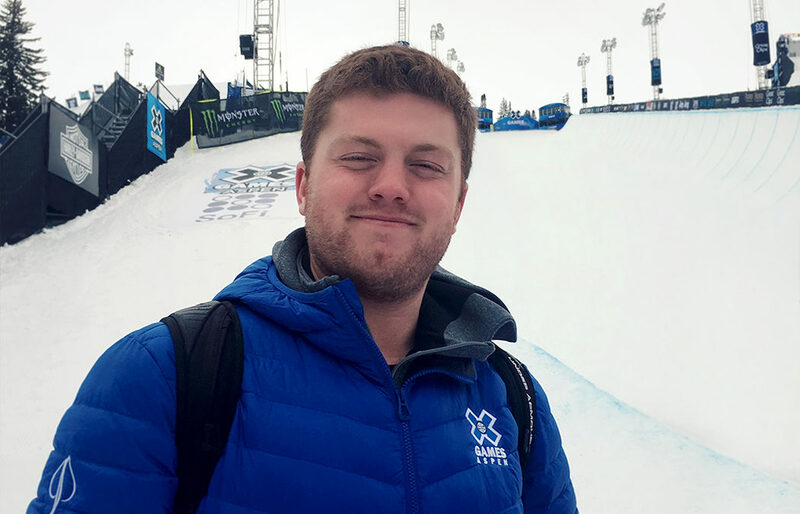 Rudh was one of 17 Saint Mary’s business students who had the unique opportunity to be part of the 2019 Winter X Games Student Work Program — led by Saint Mary’s faculty member Zakary Mayo. Based on skills and personal strengths, students were placed into different departments throughout the event and received a variety of valuable skills that will transfer to future careers — and had access to the fast-paced action. The annual action sports event features snowbiking, snowboarding, snowmobiling, and skiing events, as well as live concerts with big-name musicians. Although he hopes one day to work in the front office for a professional hockey team, Rudh is looking for any position through which he can use his data analytics skills to assess statistics for hockey, tennis, football, or basketball. A Cardinal tennis athlete, and broadcaster for Cardinal athletics, he also enjoys the communications aspects of sports and is interested in being a high school coach and an athletic director. After his experience with the X Games, Rudh now realizes that social media is another avenue worth pursuing. Two other Saint Mary’s students, Heidi Ledermann ’19 and Blair Sanders ’20 received #IMPACT awards for their work at X Fest, the main festival surrounding the X Games. X Games Event Development #IMPACT Awards are overall awards based upon the workers’ performance levels throughout the week. Winners of the Event Development #IMPACT Awards are typically nominated by the winners’ supervisors and managers. An Overall #IMPACT Award, as well as Daily #IMPACT Awards, are conferred. Ledermann cycled between the Snowskate Park, Studio X, and the SoFi X Trials and received Event Development’s prestigious Overall #IMPACT Award. “I spent most of my time at Studio X, assisting the X Fest emcees known as The Flavor Savers, and helping with the various informative TED-style talks that were put on each day,” she said. “My job was often to entice people to come to Studio X and then interact with them in a positive way throughout the day by scanning their X Games App, giving out free swag, or just asking how their X Games experience was going.” Ledermann received the prestigious Overall #IMPACT Award. During the summer and winter X Games, and across all participating universities, only one student participant is awarded the Overall #IMPACT Award. Ledermann was chosen for displaying consistent dedication to and commitment to impact the X Games guests in a positive manner. Sanders received a Daily #IMPACT Award for his work on Jan. 25 of “setting the example of courtesy” while working with the children at the SoFi X Trails within X Fest.